Hangzhou's tourist attractions draw millions of visitors every year, and reflect Hangzhou's long history as a center of culture, tourism and religion. 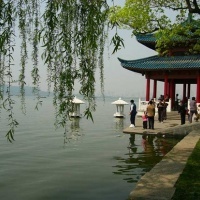 The scenic heart of the city is its famous West Lake (Xihu), which long ago was a lagoon adjoining the Qiantang River. It was dredged during the 8th century AD, and later a dyke was built that cut it off from the river and formed the lake. It looks like a bright pearl that is embed in the city. There are two brocade-ribbon-like causeways inside the lake, namely the Bai Causeway and the Su causeway. They were built by two great ancient poets Bai Juyi (Tang Dynasty) and Su Dongpo (Northern Song Dynasty) respectively. They divide the lake into five portions. If you walk along the causeways with the local guide, you will know some thought-provoking things about their builders. 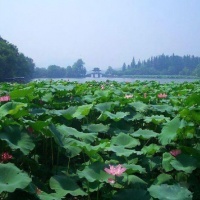 The West Lake Scenic Area in Hangzhou Covers an area of 6.3 square kilometers, out of which the West Lake occupies 5.66 square kilometers with 3.3 kilometers from north to south and 2.8 kilometers from west to east. The lake has a circumference of 15 kilometers. Its mean water depth is about 1.5 meters. It is surrounded by hills on tree sides and faces the downtown area on one side. 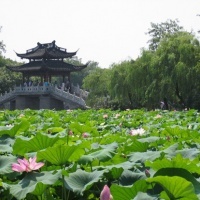 With its temples, causeways, bridges, pagodas and romantic legends, West Lake has become a Mecca for sightseeing. For centuries, it has inspired poets and painters from all over China. Visitors often follow a scenic itinerary known as the Ten Scenes of West Lake, which includes prospects with delightfully poetic names like Lingering Snow on the Broken Bridge, Orioles Singing in the Willows, and Twin Peaks Piercing the Cloud. Equally intriguing are the names of the Ten New Scenes of West Lake, which include Inquiring about Tea at Dragon Well, and Heavenly Wind over Wu Hill. One of the lake's most-visited spots is its largest island-Solitary Island, also known as Solitary Mountain. It is the site of the Zhejiang Provincial Museum, which has an excellent collection of artifacts from prehistoric times to the Ming and Qing dynasties.